This book is part of the Pearson Automotive Professional Technician Series, which provides full-color, media-integrated solutions for today’s students and instructors covering all eight areas of ASE certification, plus additional titles covering common courses. Peer reviewed for technical accuracy, the series and the books in it represent the future of automotive textbooks. 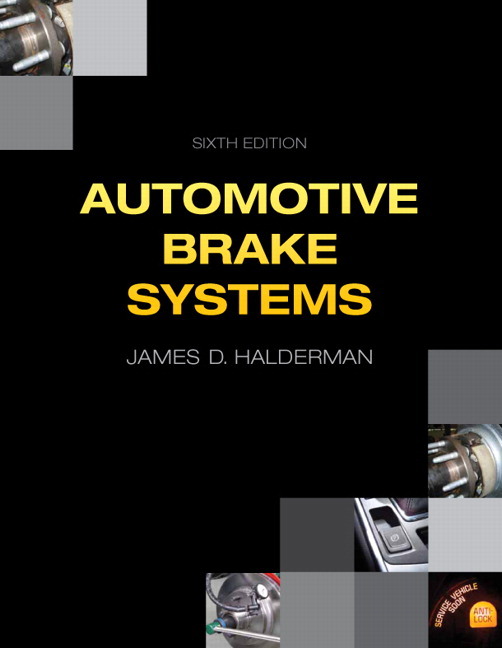 This title is designed to be a one-semester text and covers the fundamental ASE/NATEF designated topic of Automotive Brake Systems (A5), as well as the advanced brake system topics taught in all schools and colleges. Prepare tomorrow’s automotive professionals for success. Automotive Brake Systems, 7/e covers every electrical and electronic brake component found on vehicles today, as well as the practical skills that students must master to be successful in the industry. Written by a service technician and an automotive instructor—not a technical writer—and fully up to date with the latest electrical and electronic brake systems devices and systems used since 2005, the text is revered as the best available text on the subject. Formatted to appeal to today's technical trade students, Halderman’s text uses helpful tips and visuals to bring concepts to life and guide students through the procedures they'll use on the job. To keep your course current, all of the content is correlated to the latest NATEF tasks and ASE areas for Automotive Brake Systems (A5), and new or updated information is included on such topics as brake friction materials, qualifying a brake lathe, the GM regular production code (RPO), ceramic brake pads and environmental concerns of copper in brake friction material, the BCM control of the red brake warning light, and brake line corrosion reduction coating. Present topics in short, easy-to-read chapters. Automotive Brake Systems, 7/e makes teaching and learning easier by breaking the content into small, manageable segments. It features twice as many chapters as competitive texts so that a topic or an entire short chapter can be assigned and taught instead of assigning individual page numbers or questions. Explain how to diagnose faults. In addition to explaining how a system works, most chapters include diagnostic procedures and the steps needed to troubleshoot faults. Demonstrate how automotive systems are connected. The theory, construction, diagnosis, and service of a particular component or system are presented together, in one location. All of the information that students need to understand a topic is included when it is presented, so there is no need to search through the book for other references to the same topic. UPDATED: Deliver the most up-to-date standards content. All content in the book has been updated and correlated to the latest NATEF task requirements for MLR, AST and MAST, and ASE areas. Engaging art programs support today’s visual learner. UPDATED: Over 40 new full-color line drawings and photos have been added to help bring the subject to life. The photos show the actual parts involved so that readers can view a good or defective part. The line drawings allow the reader to see what is inside a component and how it works. Break a task down using step-by-step photos. Step-by-step photo sequences detail the steps involved in performing a specific task or service procedure. UPDATED: Make reading, studying, and content mastery easier. Every chapter includes new bulleted and numbered lists to summarize concepts or the steps in a procedure, while the new design for main and sub-headings makes it easier to grasp the scope of the chapter. Finally, each chapter ends with a Summary, Review Questions, and a Quiz. Answers to chapter questions can be found in the Instructor’s Manual. Many new review and chapter quiz questions now match the new and updated content in each chapter. Help students prepare for their professional career. Prepare for the ASE Certification exam. ASE test correlation charts and NATEF task correlation charts are provided in the Instructor’s Manual. The textbook and workbook page numbers are listed in the NATEF correlation guides to make learning and teaching easier. Provide learning goals based on NATEF tasks. Each chapter opens with a list of Learning Objectives based on specific NATEF tasks. Offer the perspective of a technician and automotive instructor. The author delivers the point-of-view of a technician and automotive instructor rather than an engineer, technical writer, or salesperson. Alert students to potential safety hazards. Safety Tips alert students to possible hazards on the job. Give practical advice. Tech Tips offer real-world advice from ASE-certified master technicians. Answer Frequently Asked Questions. Based on the author’s own experience, FAQs provide answers to questions often asked by students and beginning service technicians. UPDATED! Case Study features, previously Real World Fix, now include the “Three Cs”, Complaint, Cause and Correction. They present students with actual service scenarios and show how the problems were diagnosed and repaired. Give students a greater understanding of a specific task. Notes provide additional technical information. Limit potential damage to the vehicle. Cautions alert students to potential damage to the vehicle that can occur during a specific service procedure. Limit potential harm to the technician. Warnings alert students to potential harm that may occur to the technician during a specific service procedure. 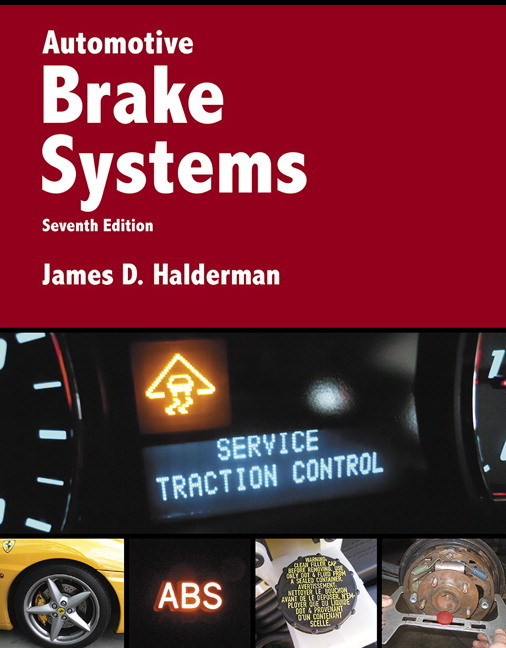 NEW: Chapter 4 on brake principles now includes the details on brake friction materials. NEW: Qualifying brake lathe information has been added to Chapter 15. NEW: The three chapters on antilock brake systems (ABS) have been condensed and updated to two new chapters (17 and 18). UPDATED: Chapter 20 on regenerative brakes has been moved to the end of the book. NEW: The GM regular production code (RPO) information is included in Chapter 3 (Braking System Components and Performance Standards). NEW: The BCM control of the red brake warning light (RBWL) has been added to Chapter 6. NEW: Brake line corrosion reduction coating has been added to Chapter 7 (Brake Fluid and Lines). NEW: New disc brake photo sequence added to Chapter 13 (Disc Brake Diagnosis and Service). Supplement your course with a full instructor support package. To make teaching from this text easier, textbook adopters have access to a computerized Test Bank and presentation slides. Get up and running quickly using the Instructor’s Manual.The Instructor’s Manual contains Sample Syllabus, NATEF Task List, Chapter Outline, and Answers to chapter questions. Use the additional teaching notes keyed to the textbook page numbers to help you prepare to discuss, review, preview, and reinforce important content. Bundle with the ASE Test Prep Guide or the NATEF Correlated Task Sheets. Contact your Pearson Representative to find out how your students can save when you bundle the ASE Test Prep Guide and NATEF Correlated Task Sheets workbook. Deliver the most up-to-date standards content. All content in the book has been updated and correlated to the latest NATEF task requirements for MLR, AST and MAST, and ASE areas. Engaging art programs support today’s visual learner. Over 40 new full-color line drawings and photos have been added to help bring the subject to life. The photos show the actual parts involved so that readers can view a good or defective part. The line drawings allow the reader to see what is inside a component and how it works. Make reading, studying, and content mastery easier. Every chapter includes new bulleted and numbered lists to summarize concepts or the steps in a procedure, while the new design for main and sub-headings makes it easier to grasp the scope of the chapter. Finally, each chapter ends with a Summary, Review Questions, and a Quiz. Answers to chapter questions can be found in the Instructor’s Manual. Many new review and chapter quiz questions now match the new and updated content in each chapter. Case Study features, previously Real World Fix, now include the “Three Cs”, Complaint, Cause and Correction. They present students with actual service scenarios and show how the problems were diagnosed and repaired. Chapter 4 on brake principles now includes details on brake friction materials. Qualifying brake lathe information has been added to Chapter 15. The three chapters on antilock brake systems (ABS) have been condensed and updated to two new chapters (17 and 18). Chapter 20 on regenerative brakes has been moved to the end of the book. The GM regular production code (RPO) information is included in Chapter 3 (Braking System Components and Performance Standards). The BCM control of the red brake warning light (RBWL) has been added to Chapter 6. Brake line corrosion reduction coating has been added to Chapter 7 (Brake Fluid and Lines). New disc brake photo sequence added to Chapter 13 (Disc Brake Diagnosis and Service). Jim Halderman brings a world of experience, knowledge, and talent to his work. His automotive service experience includes working as a flat-rate technician, a business owner, and a professor of automotive technology at a leading U.S. community college for more than 20 years. He has a Bachelor of Science Degree from Ohio Northern University and a Masters Degree in Education from Miami University in Oxford, Ohio. Jim holds a U.S. Patent for an electronic transmission control device. He is an ASE certified Master Automotive Technician and is Advanced Engine Performance (L1) ASE certified. Jim is the author of many automotive textbooks all published by Pearson Education. He has presented numerous technical seminars to national audiences including the California Automotive Teachers (CAT), the Illinois College Automotive Instructor Association (ICAIA), as well as a member and presenter at the North American Council of Automotive Teachers (NACAT). Jim was also named Regional Teacher of the Year by General Motors Corporation and outstanding alumni of Ohio Northern University. He and his wife, Michelle, live in Dayton, Ohio. They have two children.